Your painful elbow developed because the muscles and tendons in your forearm and wrist were not able to absorb the force placed on them while playing a sport. 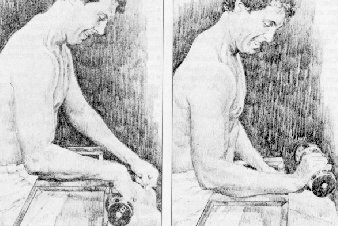 If you wish to continue playing and avoid injuring your elbow again, you must follow a regular program of exercises to improve flexibility and increase the strength and endurance of your forearm and wrist. Here are the stretching exercises you should do every day to improve flexibility. Remember, moderation is important! To start, repeat the exercises the minimum number of times and increase as you get stronger. Allow enough time to do these exercises at a reasonable pace. If you experience a lot of pain when you are doing the exercises, you're definitely overdoing it. Wrist extensor Place the backs of your hands together. Lower your elbows toward the floor as you push your hands together for 6-10 seconds. Relax. Repeat 6-10 times. Wrist flexor Place the palms of your hands together . Raise your elbows as you push your palms together for 6-10 seconds. Relax. Repeat 6-10 times. Forearm extensor stretching Sit down at a table and stretch out your affected arm, palm sid e down, on the tabletop. Raise your arm slightly off the tabletop, and with the opposite hand, bend the fingers and wrist of your extended arm downward until you feel your forearm muscles stretching. Hold that position for three seconds; rest for three seconds. Repeat only a few times at the beginning of your exercise program; as you become stronger, you can gradually increase the number of repetitions to a maximum of 30. 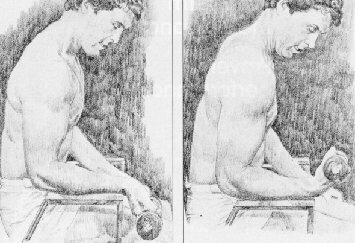 Forearm flexor stretching While still seated at the table with your affected arm stretched out from the previous exercises use the opposite hand to pull the fingers and wrist of your extended arm backward until you feel your forearm muscles stretching. Hold that position for three seconds; rest for three seconds. Start with a few repetitions; as you become stronger, you can gradually increase the number of repetitions to 30. This aid shows the strengthening exercises you should do every day if you wish to continue playing your favorite sport. 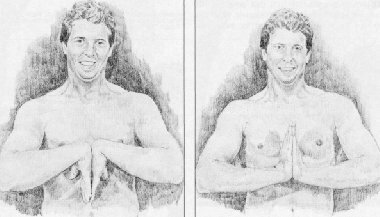 Do this series of strengthening exercises as soon as you have completed your stretching exercises on the previous page. Wrist flexion Sit in a chair with a broad arm; place your forearm on the chair arm, palm up, with your hand extended beyond the end of the chair arm. Keep your elbow bent at a 90 degree angle. Grasp a dumbbell (or a similar easily held weight, such as a plastic bag filled with sand), and allow your hand to be pulled downward. Slowly raise your hand against the weight until your wrist is fully bent upward. Hold for one second. Then lower your hand slowly to the starting position. Wrist extension While sitting in the chair with your elbow bent 90 degrees, turn your forearm so that your palm is down and your hand extends beyond the end of the chair arm. Grasp the dumbbell and allow your hand to be pulled downward. Slowly raise your hand against the weight until your wrist is fully bent upward. Hold that position for one second. Then lower your hand slowly to the starting position. Do 10 repetitions of wrist flexion (a "set"), then 10 repetitions of wrist extensions. Continue to alternate sets until you have done three sets of each exercise. Rest five minutes. Then do three more sets of each exerciser alternating between flexion and extensions. Start with a 2 ½-lb weight and gradually increase to a maximum of 10 lb if you can. As you r strength improves, alternately increase either the repetitions or the amount of weight. Freeze water in polystyrene plastic (Styrofoam) cups. To apply the ice, tear off the top portion of the cup; leave the bottom portion intact. Rub the ice over your elbow for 15-20 minutes. If you'd rather rest your elbow in ice for the 15-20 minutes, try this: Mold a plastic bag containing loose-packed frozen peas or corn around your elbow. You can refreeze the bag for future ice treatments, but don't eat the vegetables since they will probably spoil.